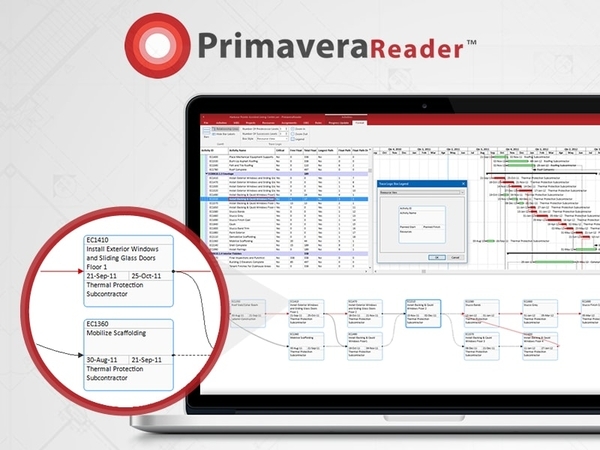 PrimaveraReader version 3.6 introduces Trace Logic View, Critical Path and Driving Activities. MALMOE, SWEDEN, June 13, 2017 /24-7PressRelease/ — Seavus, the global master distributor of PrimaveraReader , the reader for XER and XLS schedules announces the latest release with new features and improvements for easy Visual Analysis. The new Version 3.6 includes Trace Logic View, Critical Path, Driving Activities and additional Gantt chart improvements, such as the Gantt Chart Legend and the option to hide Gantt labels. The Trace Logic view is used for detailed analyses as it visually presents selected segments of the project schedule. This view is combined with the Activity View. When a particular activity is selected in the Activity view, the same activity will be in the focus at the bottom of the Trace Logic view showing predecessor and successor activities, and critical path arrows (red). The Critical Path feature presents the chain of project schedule activities that determine the project end date. This is important information for the project schedulers in order to monitor the critical path activities and manage the potential issues on time. Thus, any delays with the project reaching the project milestones on time can be easily noticed and appropriate action can be taken accordingly. Driving activities functionality allows the users to detect activities of great importance with regard to the deadline of the project plan. With this option team members can clearly view the activities that drive the project and need more attention and analysis. In this version, the Gantt chart is described by Gantt chart legend which shows the bar styles and colors incorporated in the Gantt chart and their corresponding representation. This improvement is especially beneficial to those that use the Baselines feature to compare several versions of a project schedule. PrimaveraReader version 3.6 is available for download (free trial) and purchase from the official website: www.primaverareader.com. Seavus is an international software development, outsourcing and consulting company with a proven track-record in providing successful enterprise-wide business solutions. The company has over 650+ IT experts worldwide and offers a variety of products and service options, successfully covering the European and US market from several offices in the world. Seavus’s expanding portfolio covers: Telecom BSS/OSS, Billing solutions, CRM, CEM, Business Intelligence and DWH solutions, Banking, Insurance and Financial platforms, Embedded solutions, Business and consumer products, Mobile and gaming solutions, Managed services, as well as custom development, quality assurance, consultancy and resourcing. The Seavus portfolio includes over 3,500 customers, including leading worldwide telecoms and handset manufacturers, organizations from the banking and finance industry, consumer electronics, technology, education, government, and health, to name but a few.